The worlds strongest fruit beer. 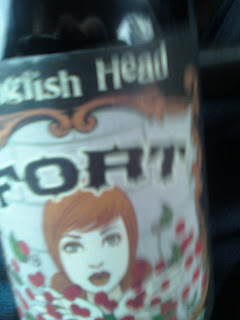 It's a claim that only Dogfish Head can make with their 18% ABV brew, Fort. When brewed, they use over a ton of pureed raspberries in a Belgian-style base which is then fermented similar to the DFH's other 18% beers, 120 Minute IPA and World Wide Stout. Being a fan of Dogfish Head, alcohol and World Wide Stout (we have yet to get our hands on a 120,) Mike did not hesitate dropping the serious cash to get this single bottle. Once again, silly Ohio laws prevent such beverages from entering their borders, so he had to pick this one up in Pennsylvania. Fort pours surprisingly smooth, and smells of fruit and spices- almost like a Riesling. Amber and slightly cloudy in color, the taste hits on the side of the tongue with a sweet and almost tart spiciness followed by some fruit flavors. The raspberries are in the latter half of flavor to hit the palette followed by an alcohol warmth. Being so high in alcohol, one would not believe that a brew like this could drink so smooth, but smooth it is. It's medium bodied and does not taste like it packs as much punch as it does. Rating this beer is difficult. Do you rate by style? In that case, it would would be rated extremely high? Do you rate by taste? Originality? We are just going to rate how we normally do- how much we like it. The beer has some outstanding qualities and it's flaws are limited. It is NOT a session beer. Oz says: "It isn't a style that I would normally go for but the alcohol makes this yummy!" Dogfish Head keeps coming up with original beers and we will keep buying them. They could find a way to make ancient elephant excrement taste delicious or at least interesting.